Always thought you had a talent for singing and have grown tired of singing into your hairbrush or in the shower? Now is your chance to take a step to fame with Fremantle’s X-Factor Steps to Stardom slot machine where you have to impress the judges – let’s hope Simon’s in a friendly mood! The reality TV show first hit our screens back in 2004 and has produced some incredible artists including One Direction and Leona Lewis (plus the not so greats like Jedward and Wagner) and sees auditions held around the country before those lucky to be selected are whittled down at bootcamp, the judge’s houses, and live shows until the winner is crowned – who then secures a record deal and shoots to fame. The sounds and overall design of X-Factor Steps to Stardom are very impressive. Not only does the famous introductory tune music ring out as the slot loads and the stage is set, but as you spin the reels the dramatic sounds that are used when it is crunch time play which really get you on edge in anticipation of the thoughts of the judges on your performance. A common slots myth is that Wild symbols must be used in every slot machine. While it is very uncommon for slots not to feature Wild symbols nowadays, that is simply not true, and X-Factor Steps to Stardom highlights this with the exclusion, but there are ten other symbols that can bring big rewards instead. 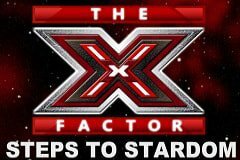 The most valuable of these is the famous X-Factor logo which pays 5,000x for five on a single payline, with a female singer, male singer, silhouette of a female hitting a high note, microphone, speaker, X-Factor contestant number label, CD, and two special symbols needed for the bonus features – the Boot Camp and Judge Bonus Scatter symbol. Making it through auditions held around the country see contestants whittled down to a lucky few that make it to Boot Camp where they battle it out against fellow contestants to further impress the judges and secure a position in the live shows. For this opportunity you’ll first need to land three or more of the X symbols (large X with the silhouette of the audience), with the number you land determining how many free spins you have earned, as follows. Not only are all winning combinations worth more than their base game values, you are also tasked with accumulating silver stars as the feature plays out – with the aim being to secure ten which grant you a place on the live shows. In the live show you hit the stage and then get offered three separate rewards for Performance, Judge’s Verdict, and Audience Reaction so you better hit those high notes well. There is a cash value associated with each of these and if you think your talents are worth more than what is offered you can actually reject the first and second offers in the hope that the third will be larger – but if it’s not tough luck as you are forced to take this one. What Will the Verdict Be? Of course, no matter how great your mum says you are at singing, the most important opinion lies with the judges and their verdict will either make you a star or see you trot back to your boring job with the same routine to endure on a daily basis. To have the spotlight shine on you, you’ll first need to land three or more of the Judge’s Bonus symbols. You then find yourself on stage with your future lying in the hands of the four judges, hoping that the hard to impress Simon Cowell will be in a good mood and give you a Yes with the others. It’s a simple game that sees you click the ‘Reveal Verdict’ button to see either a yes or a no. If it’s a yes you’ll be rewarded with a cash prize and get to double up each time as you risk the verdict of the other judges – but a no sees you lose previous winnings and ends the feature, so don’t get too confident in your abilities! Does It Really Have the X-Factor? Played across 5 reels and 20 paylines with stakes ranging from 20p up to £500 per spin, it certainly does have the X-Factor and I certainly preferred this version to Ash Gaming’s X Factor Jackpot slot machine, and it is much more exciting than other reality-TV themed slots (the Big Brother slot from Endemol Games being a prime example).